Midsummer Dreams … and nightmares. 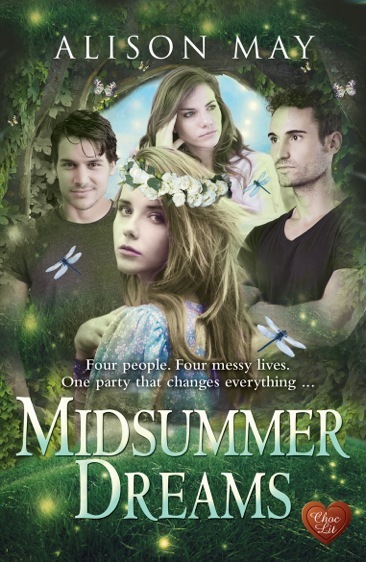 Today is the launch of the lovely Alison May’s brand new romantic comedy, Midsummer Dreams. To celebrate with Alison I, and a number of other writers, are today blogging on the theme of all things dream-related. First, a little about Alison’s book. Isn’t the cover fabulous? My actual dreams rarely make sense and all I can recall are fleeting fragments. Trust me, you wouldn’t want to read about them! So instead I shall reveal my ‘dream’, which is to make enough money from writing to earn a comfortable living. Was that a hollow laugh? I won’t take it personally—it’s hard for anyone to earn sufficient to have no need of supplementary income so, yes, it is possibly a pipe-dream but it’s there in my subconscious nevertheless. Along with a room overlooking the coastline—the wilder and more rugged the better (and where the cliffs are never subject to erosion, of course!) and a villa somewhere hot where I could write overlooking an Italian lake or the Mediterranean. Yup, definitely a pipe-dream! My nightmare and, in fact, this nightmare is both real and regular. It’s not the stuff of monsters or murderers, but the nightmare of being late. Sounds innocuous, doesn’t it? The nightmare always centres around me hurrying to get ready to go somewhere but the harder I try the more everything goes wrong: the shower won’t work; people interrupt me; the toast burns. But the very worst part is getting dressed. Clothes don’t fit. They disintegrate in my hands. Sometimes I simply can’t find any and while I rush around half-dressed, the clock keeps ticking—I’m half an hour behind… an hour… longer. I get increasingly panicked until I wake up, disorientated and with a feeling of impending disaster. Suffice it to say, with that as my nightmare, I’m always conscious of being on time! Deadlines, of course, can become a waking nightmare—one of the reasons this blog has been sadly neglected of late. Maybe my subconscious is trying to tell me something! My dream for the future…I’m going global for this one. The usual world peace and freedom from hunger and disease for all almost goes without saying. What sane person wouldn’t want those? But what I dream of for a better world is for everyone to use just a tad more tolerance, patience and kindness with others, starting with the everyday interactions such as when driving or queuing, for instance. Showed others a little more respect would go a long way to making this world a better place to live, in my opinion. Sadly, society appears to be rushing headlong in the opposite direction. So, there you have it. My take on the subject of dreams. What are your dreams or nightmares? I’d love to hear about them.